For the locality in Queensland, Australia, see Berat, Queensland. Berat (Albanian pronunciation: [ˈbɛ:rat], definite Albanian form: Berati), is the ninth largest city by population of the Republic of Albania. The city is the capital of the surrounding Berat County, one of 12 constituent counties of the country. By air, it is 71 kilometres (44 miles) north of Gjirokastër, 70 kilometres (43 miles) west of Korçë, 70 kilometres (43 miles) south of Tirana and 33 kilometres (21 miles) east of Fier. Geographically, Berat is located in the south of the country surrounded by mountains and hills including Tomorr on the east that was declared a national park. For a total length of 161 kilometres (100 miles) the Osum River runs through the city before it empties into the Seman River within the Myzeqe Plain. Berat, designated a UNESCO World Heritage Site in 2008, comprise a unique style of architecture with influences from several civilizations that have managed to coexist for centuries throughout the history. Like many cities in Albania, Berat comprises an old fortified city filled with churches and mosques painted with grandiose wealth of visible murals and frescos. The name of the city in Albanian is "Berat" or "Berati", which is probably derived from the Old Slavonic Бѣлградъ or "Bel(i)grad" (Белград, meaning "white city" in the South Slavic languages), under which name it was known in Greek, Bulgarian, Latin and Slavic documents during the High and Late Middle Ages. That name was rendered as Bellegrada (Βελλέγραδα) in Greek. It is believed to have been the site of the ancient city "Antipatreia" (Ancient Greek: Ἀντιπάτρεια "city of Antipater") or "Antipatrea" in Latin, while during the early Byzantine Empire the name of the town was "Pulcheriopolis" (Greek: Πουλχεριόπολις, "city of Pulcheria"). In the Republic of Venice the city was known as Belgrad di Romania, while in the Ottoman Empire it was also known as Belgrad-i Arnavud (Albanian Belgrade) to distinguish it from Belgrade. Berat lies on the right bank of the river Osum, a short distance from the point where it is joined by the Molisht river. The old city centre consists of three parts: Kalaja (on the castle hill), Mangalem (at the foot of the castle hill) and Gorica (on the left bank of the Osum). It has a wealth of beautiful buildings of high architectural and historical interest. The pine forests above the city, on the slopes of the towering Tomorr mountains, provide a backdrop of appropriate grandeur. The Osumi river has cut a 915-metre deep gorge through the limestone rock on the west side of the valley to form a precipitous natural fortress, around which the town was built on several river terraces. According to an Albanian legend, the Tomorr mountain was originally a giant, who fought with another giant (mountain) called Shpirag over a young woman. They killed each other and the girl drowned in her tears, which then became the Osum river. Mount Shpirag, named after the second giant, is on the left bank of the gorge, above the district of Gorica. Berat is known to Albanians as the city of "One above another Windows" (a similar epithet is sometimes applied to Gjirokastra), or The City of Two Thousand Steps. It was proclaimed a 'Museum City' by the dictator Enver Hoxha in June 1961. The earliest recorded inhabitants of the city (6th century BC) were the Illyrian tribe of the Dassaretae or Dexarioi, the northernmost subgroup of the Chaonians, and the region was known as Dessaretis after them. Modern Berat occupies the site of Antipatreia (Ancient Greek: Ἀντιπάτρεια), which originally was a settlement of the Dexarioi and later a Macedonian stronghold in southern Illyria. The founding date is unknown, although if Cassander is the founder it has been suggested that Antipatreia was founded after he took control of the region around 314 BC. In 200 BC it was captured by the Roman legatus Lucius Apustius, who razed the walls and massacred the male population of the city. The town became part of the unstable frontier of the Byzantine Empire following the fall of the western Roman Empire and, along with much of the rest of the Balkan peninsula, it suffered from repeated invasions by Slavs. During the Roman and early Byzantine period, the city was known as Pulcheriopolis. The First Bulgarian Empire under Presian I captured the town in the 9th century, and the city received the Slavic name Bel[i]grad ("White City"), Belegrada (Βελέγραδα) in Greek, which persisted throughout the medieval period, changing to Berat under Ottoman rule. The town became one of the most important towns in the Bulgarian region Kutmichevitsa. The Bulgarian governor Elemag surrendered the city to the emperor Basil II in 1018, and the city remained in Byzantine hands until the Second Bulgarian Empire retook the city in 1203 during the rule of Kaloyan. During the 13th century, it fell to Michael I Ducas, the ruler of the Despotate of Epirus. The entrance of the citadel, with the 13th century Byzantine Holy Trinity Church. Byzantine Emperor Michael VIII Palaiologos sent letters to the Albanian leaders of Berat and Durrës in 1272 asking them to abandon their alliance with Charles I of Naples, leader of the Kingdom of Albania, who had captured and incorporated it at the same period in the Kingdom of Albania. However, they sent the letters to Charles as a sign of their loyalty. In 1274 Michael VIII recaptured Berat and after being joined by Albanians who supported the Byzantine Empire, marched unsuccessfully against the Angevin capital of Durrës. In 1280-1281 the Sicilian forces under Hugh the Red of Sully laid siege to Berat. In March 1281 a relief force from Constantinople under the command of Michael Tarchaneiotes was able to drive off the besieging Sicilian army. Later in the 13th century Berat again fell under the control of the Byzantine Empire. In 1335 Albanians from Epirus Nova invaded the area of Berat and appeared in Epirus for the first time, while in 1345 (or maybe 1343) the town passed to the Serbian Empire. After its dissolution in 1355 Berat came under suzerainty of its former governor, John Komnenos Asen (1345-1363), Alexander Komnenos Asen (1363-1372) and Zeta of Balša II (1372-1385). In 1385 Berat was captured by the Ottomans, before the Battle of Savra. According to some sources, the Ottomans probably remained in Berat for some time with intention to use it as foothold to capture Valona. By 1396 Muzaka family took over control of Berat which became the capital of the Principality of Berat. In 1417 Berat became a part of the Ottoman Empire. In 1455 Skanderbeg unsuccessfully tried to capture the city. In the 18th century, Berat was one of the most important Albanian cities during the Ottoman period. In the early modern era the city was the capital of the Pashalik of Berat founded by Ahmet Kurt Pasha. Berat was incorporated in the Pashalik of Yanina after Ibrahim Pasha of Berat was defeated by Ali Pasha in 1809. In 1867, Berat became a sanjak in Yannina (Yanya) vilayet. During the early period of Ottoman rule, Berat fell into severe decline. By the end of the 16th century it had only 710 houses. However, it began to recover by the 17th century and became a major craft centre specializing in wood carving. During the 19th century, Berat played an important part in the Albanian national revival. A Greek school was operating in the city already from 1835. In the late nineteenth and early twentieth centuries, Orthodox Christians in Berat numbered some 5,000 people of whom 3,000 spoke the Aromanian language and the rest the Albanian language. Berat became a major base of support for the League of Prizren, the late 19th century Albanian nationalist alliance, while the city was also represented in the formation of southern branch of the league in Gjirokastër. From 23 to 30 October 1944, the second session of the Council of National Liberation of Albania was held in Berat, where the National Liberation Movement-controlled Anti-Fascist National Liberation Committee became the Provisional Democratic Government of Albania, with Enver Hoxha as its prime minister and minister of defence. By the 18th century the economy and society of Berat was closely connected to the city's craft guilds partly related to various tax exemptions that existed since the late Middle Ages. By 1750 there were twenty-two guilds, the most important of which were the tanners', the cobblers' and other leather-working guilds. Other guilds included metal-working, silver-smithing and silk-making ones. The coexistence of religious and cultural communities over several centuries, beginning in the 4th century BC into the 18th century is apparent in Berat. The town also bears testimony to the architectural excellence of traditional Balkan housing construction, which date to the late 18th and the 19th centuries. Some of the landmarks of that historical period could be seen in the Berat Castle, churches of the Byzantine era such as the Church of St. Mary of Blaherna (13th century), the Bachelors' Mosque, the National Ethnographic Museum, the Sultan's Mosque (built between 1481 and 1512), Leaden Mosque (built in 1555) and the Gorica Bridge. View of the Citadel of Berat. Berat Castle is built on a rocky hill on the right bank of the river Osum and is accessible only from the south. After being burned down by the Romans in 200 BC the walls were strengthened in the 5th century under Byzantine Emperor Theodosius II, and were rebuilt during the 6th century under the Emperor Justinian I and again in the 13th century under the Despot of Epirus, Michael Komnenos Doukas, cousin of the Byzantine Emperor. The main entrance, on the north side, is defended by a fortified courtyard and there are three smaller entrances. The fortress of Berat in its present state, even though considerably damaged, remains a magnificent sight. The surface that it encompasses made it possible to house a considerable portion of the town's inhabitants. The buildings inside the fortress were built during the 13th century and because of their characteristic architecture are preserved as cultural monuments. The population of the fortress was Christian, and it had about 20 churches (most built during the 13th century) and only one mosque, for the use of the Muslim garrison, (of which there survives only a few ruins and the base of the minaret). The churches of the fortress have been damaged through the years and only some remain. The Church of St. Mary of Blachernae dating from the 13th century, has 16th century mural paintings by Nikollë Onufri, son of the most important post-medieval Albanian painter, Onufri. In a small tree - planted square, on a hillside inside the walls of the fortress, stands the 14th century Church of the Holy Trinity. It is built in the form of a cross and has Byzantine murals. Outside the ramparts is the Church of St. Michael (Shën Mehill), built in the 13th century. This church is reached by a steep but perfectly safe path. Near the entrance, after a guardhouse, is the little Church of St. Theodore (Shen Todher), which have wall paintings by Onufri himself. The most interesting is the cathedral of St. Nicholas, which has been well restored and is now a museum dedicated to Onufri. Onufri was the greatest of the 16th century painters in Albania. Not only was he a master of the techniques of fresco and icons, but he was the first to introduce a new colour in painting, shiny red, which the French called "Onufri's Red". In addition, Onufri introduced a certain realism and a degree of individuality in facial expression. The UNESCO Site of Berat. The first inscription recording Onufri's name was found in 1951, in the Shelqan church. The Kastoria church has a date 23 July 1547 and a reference to Onufri's origin : I am Onufri, and come from the town of Berat. Onufri's style in painting was inherited by his son, Nikolla (Nicholas), though not so successful as his father. In Onufri's museum can be found works of Onufri, his son, Nikolla and other painters'. There are also numbers of icons and some fine examples of religious silversmith's work (sacred vessels, icon casings, covers of Gospel books, etc.). Berat Gospels, which date from the 4th century, are copies (the originals are preserved in the National Archives in Tirana). The church itself has a magnificent iconostasis of carved wood, with two very fine icons of Christ and the Virgin Mary. The bishop's throne and the pulpit are also of considerable quality. Near the street running down from the fortress is the Bachelors' Mosque (Xhami e Beqareve), built in 1827. This has a handsome portico and an interesting external decoration of flowers, plants, houses, etc. The 'Bachelors' were the young shop-assistants (in practice generally unmarried), whom the merchants in Berat used as their own private militia. The King Mosque (Albanian: Xhamia e Mbretit), the oldest in the town built in the reign of Bayazid II (1481–1512), is notable for its fine ceiling. Berat as seen from the Castle. The Halveti Tekke (Teqe e Helvetive) is thought to have been built in the 15th century. It was rebuilt by Ahmet Kurt Pasha in 1782. It belongs to the Khalwati Sufi order. It is composed of the prayer hall with a square plan, a small ambience for special religious services and a gracious portico in front of the entrance to the prayer hall. In the prayer hall is a mafil carved in wood and decorated. On the eastern side of the prayer hall is the mihrab decorated with stone stalactites. The inner walls have been decorated with eight frescoes, depicting dwelling houses, Muslim religious buildings and landscapes. The walls below the frescoes are covered by holes that improve the acoustics in the prayer hall. The ceiling of the prayer hall is made of wood and is decorated with paintings valued as the most beautiful of the time. The ceiling has been decorated in the Baroque style adopted in Islamic art and is covered with 14 carat gold plates. The inner decorations were carried out by Master Dush Barka. Attached to the prayer hall is a room in which once was the mausoleum of Ahmet Kurt Pasha and his son. The portico of the tekke has five stone columns which were taken from the ancient Greek city of Apollonia. Above the main door in the portico is an inscription dedicated to the values of the tekke and to Ahmet Kurt Pasha. Near of tekke is purported to be the grave of Shabbatai Zevi, a Turkish Jew who had been banished to Dulcigno (present day Ulcinj) who created controversy among his followers upon his conversion to Islam. The town is still renowned for its historic architecture and scenic beauty and is known as the "Town of a Thousand Windows", due to the many large windows of the old decorated houses overlooking the town. It is unclear whether it really means "Thousand" (një mijë) or "One over Another" (një mbi një) windows. Indeed, the quarter is built in a very steep place and windows seem to be one over another. Similar views can be seen in Melnik, Bulgaria, Gjirokastër in Albania, as well as Catanzaro in Italy, where an Albanian minority once lived. The Citadel overlooks the river and the modern city as well as the old Christian quarter across the river. It is a well preserved area containing narrow streets, Turkish houses and Orthodox churches. Modern Berat consists of three parts divided by the Osum River: Gorica ("little mountain" in Old Church Slavonic), Mangalem and Kalaja, the latter being a residential quarter within the old Byzantine citadel that overlooks the town. The town also has a 15th-century mosque and a number of churches of the Albanian Orthodox Church, whose autocephaly was proclaimed there in 1922. Several of the churches house works by the renowned 16th century painter Onufri. 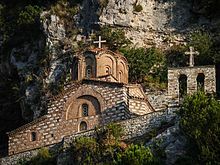 The St. Michael's Church of Berat. Berat National Ethnographic Museum opened in 1979. It contains a diversity of everyday objects from throughout Berat's history. The museum contains non-movable furniture which hold a number of household objects, wooden case, wall-closets, as well as chimneys and a well. Near the well is an olive press, wool press and many large ceramic dishes, revealing a glimpse of the historical domestic culture of Berat's citizens. The ground floor has a hall with a model of a medieval street with traditional shops on both sides. On the second floor is an archive, loom, village sitting room, kitchen and sitting room. Gorica Bridge, which connects two parts of Berat, was originally built from wood in 1780 and was rebuilt with stone in the 1920s. The seven-arch bridge is 129 metres (423 ft) long and 5.3 metres (17 ft) wide and is built about 10 metres (33 ft) above the average water level. According to local legend, the original wooden bridge contained a dungeon in which a girl would be incarcerated and starved to appease the spirits responsible for the safety of the bridge. Albanian University in Berat is a private institution, independent and secular Higher Education, which operates the state fee. Licensed by the Council of Ministers, no. 697 dated 18.06.2009, he opened the doors in the academic year 2009- 2010, offering programs in two faculties: Faculty of Social Sciences Programs in Science Teaching Legal, Political Science and Psychology General Administration and the Faculty of Economics with Learning programs in Banking and Finance-Business Administration. During the first academic year, about 1,000 students attended studies. A year later, this new institution offering undergraduate degrees in study programs: Preschool Teacher Education, Primary Education Teacher, English Language, Nursing, Engineering Computer and Information Technology, thus finalizing the 2010-2011 academic year with the opening of two new faculties: Faculty of Medical Sciences and the Faculty of Architecture and Inxhinierive.Academic Year 2010-2011 finds the University Berat with about 2600 students in the first cycle of study. Since the first year of its inception, the institution pointed at the center of academic life, the promotion of intellectual product and melting learning and research. Through presentations, research and exchange, the University directs and encourages the identification and development of projects that will once again consolidate its primary purpose, scientific development and research toward better quality. Berat experiences a Mediterranean climate. Due to its location in a rain shadow of Mount Tomorr the summer in Berat is much warmer than the rest of Mediterranean. The football (soccer) club is KS Tomori Berat. ^ a b Fishta, Gjergj (2005). The highland lute: (Lahuta e Malcís) : the Albanian national epic. Elsie, Robert; Mathie-Heck, Janice (trans.). London: Centre for Albanian Studies. I.B.Tauris. p. 405. ISBN 978-1-84511-118-2. Retrieved 9 January 2011. ^ a b c Hammond, N.G.L. ; Walbank, F.W. (1988). A History of Macedonia: Volume III: 336-167 B.C. Oxford University Press. p. 391. ISBN 978-0-19-814815-9. Retrieved 9 January 2011. ^ Lewis, D. M.; Boardman, John (1994). The Cambridge ancient history: The fourth century B.C. Cambridge University Press. p. 423. ISBN 978-0-521-23348-4. Retrieved 11 January 2011. ^ Wilkes, John J. (1995). The Illyrians. Oxford: Blackwell Publishing. ISBN 0-631-19807-5. ^ a b Cohen, Getzel M.; Walbank, F. W. (1995). The Hellenistic settlements in Europe, the islands, and Asia Minor. University of California Press. p. 76. ISBN 978-0-520-08329-5. Retrieved 9 January 2011. ^ Astin, A. E. (1998). The Cambridge ancient history: Rome and the Mediterranean to 133 B.C. Cambridge University Press. p. 262. ISBN 978-0-521-23448-1. Retrieved 11 January 2011. ^ Walbank, Frank William (1967). Philip V of Macedon. Archon Books. p. 138. Retrieved 11 January 2011. ^ Lala, Etleva; Gerhard Jaritz (2008). "Regnum Albaniae and the Papal Curia" (PDF). Central European University. p. 32. Retrieved 3 February 2011. ^ Wirth, Peter (2 March 1977). Regesten der Kaiserurkunden des oströmischen Reiches von 565-1453: Regesten von 1204-1282. C.H.Beck. p. 114. ISBN 978-3-406-00738-5. Retrieved 3 February 2011. ^ Norris, H. T. (1993). Islam in the Balkans: religion and society between Europe and the Arab world. Univ of South Carolina Press. p. 36. ISBN 978-0-87249-977-5. Retrieved 3 February 2011. ^ Nicol, Donald M. (11 February 2010). The Despotate of Epiros 1267-1479: A Contribution to the History of Greece in the Middle Ages. Cambridge University Press. p. 16. ISBN 978-0-521-13089-9. Retrieved 1 February 2011. ^ Bartusis, Mark C. (1997). The late Byzantine army: arms and society, 1204-1453. University of Pennsylvania Press. p. 62. ISBN 978-0-8122-1620-2. Retrieved 1 February 2011. ^ Steven G. Ellis, Lud'a Klusáková. Imagining frontiers, contesting identities. Edizioni Plus, 2007 ISBN 978-88-8492-466-7, p. 134 "In 1337 the Albanians of Epirus Nova invaded the area of Berat and appeared for the first time in Epirus". ^ Nicholas Geoffrey Lemprière Hammond. Migrations and invasions in Greece and adjacent areas. Noyes Press, 1976, ISBN 978-0-8155-5047-1, p. 61 "By 1335 they were in possession also of the area between Berat and the Gulf of Valona"
^ Nicol, Donald M. (1984). The Despotate of Epiros 1267-1479: A Contribution to the History of Greece in the Middle Ages. Cambridge University Press. p. 128. ISBN 978-0-521-26190-6. Berat may have fallen by 1343. ^ Gibbons, Herbert Adam (21 August 2013). The Foundation of the Ottoman Empire: A History of the Osmanlis Up To the Death of Bayezid I 1300-1403. Routledge. p. 159. ISBN 978-1-135-02982-1. ^ Ćurčić, Slobodan; Aimos; Preservation, Society for the Study of the Medieval Architecture in the Balkans and its (1997). Secular medieval architecture in the Balkans 1300-1500 and its preservation. Aimos, Society for the Study of the Medieval Architecture in the Balkans and its Preservation. p. 114. ISBN 978-960-86059-1-6. Retrieved 11 January 2011. ^ Fine, John V. A.; Fine, John Van Antwerp (1994). The Late Medieval Balkans: A Critical Survey from the Late Twelfth Century to the Ottoman Conquest. University of Michigan Press. p. 391. ISBN 0-472-08260-4. ...in 1396. By this time the family of Musachi had gained control of Berat. ^ Kiel, Machiel (1990). Ottoman architecture in Albania, 1385-1912. Research Centre for Islamic History, Art and Culture. p. 48. ISBN 978-92-9063-330-3. In 1417, Berat became part of the Ottoman Empire when this strong city succumbed to a surprise attack. ^ a b Amin, Camron Michael; Fortna, Benjamin C.; Frierson, Elizabeth Brown (21 April 2006). The modern Middle East: a sourcebook for history. Oxford University Press. p. 569. ISBN 978-0-19-926209-0. Retrieved 13 January 2011. ^ "Σχολή Βελεγράδων. [School of Berat]". Κάτοπρον Ελληνικής Επιστήμης και Φιλοσοφίας (University of Athens) (in Greek). Retrieved 30 October 2010. ^ Koukoudis, Asterios (2003). The Vlachs: Metropolis and Diaspora. Thessaloniki: Zitros Publications. p. 358. ISBN 9789607760869. "Berat... At the end of the nineteenth and beginning of the twentieth century, of the 5,000 or so Orthodox Christians in the town, some 3,000 were Vlach-speaking and the rest Albanian-speaking." ^ Skendi, Stavro. "Beginnings of Albanian Nationalist and Autonomous Trends: The Albanian League, 1878-1881Author". American Slavic and East European Review. American Slavic and East European Review. 12: 4. JSTOR 2491677. The southern branch of the League was formed at GjinokastEr (Argyrokastro), where;Albanian leaders held a meeting at which the districts of Janina, Gjinokast&r, Delvina, PNrmet, Berat, Vlora (Valona), Filat, Margariti, Ajdonat, Parga, Preveza, Arta, Tepelena, Kolonja, and Korca were represented. ^ Pearson, Owen (11 July 2006). Albania in Occupation and War: From Fascism to Communism 1940-1945. I.B.Tauris. p. 399. ISBN 978-1-84511-104-5. Retrieved 13 January 2011. ^ a b c "UNESCO.orgHistoric Centres of Berat and Gjirokastra". Unesco.org. Retrieved 2010-09-07. ^ a b c d "The Castle". Castle Park. Archived from the original on 26 December 2010. Retrieved 5 September 2010. ^ a b c "Ethnographic Museum". Berat Museum. Archived from the original on 5 April 2010. Retrieved 5 September 2010. ^ a b "National Ethnographic Museum, Berat". Albania Shqiperia. Archived from the original on 24 February 2011. Retrieved 5 September 2010. ^ Garwood, Duncan (2009). Mediterranean Europe. Lonely Planet. p. 60. ISBN 1-74104-856-7. Retrieved 23 July 2010. ^ "Berat". Albanian Canadian League Information Service. Archived from the original on 10 January 2011. Retrieved 2010-09-07. Wikimedia Commons has media related to Berat. Wikivoyage has a travel guide for Berat. Byrne, Jane (4 Aug 2015). "Just Back: Candied walnuts and communism in Albania". Telegraph.